In this section of the website you will find information about the Library, our mission, and the Library's contact information. Make contact with a library department. Check out our FAQs for answers to frequent questions. Find the SWC Library closest to you. Library hours change depending on the time of year. The library at the Main Campus at Chula Vista is located in the Learning Resource Center on the north side of campus in building 620. The library at the Higher Education Center at Otay Mesa is located on the second floor of building 4200. Here is an interactive online map with directions. Library reference services are also provided at the Higher Education Center at National City in room 7120. Here is an interactive online map to the Higher Education at National City. The library at the Higher Education Center at San Ysidro is located in room 5105. Here is a map that will provide you with directions to the campus. The mission of the Southwestern College Library is to contribute to and support learners by identifying, organizing, preserving, and making accessible resources which are in support of the college curriculum and general enrichment for students, faculty, staff, and the community. In 1998, California voters approved new financing which allowed Southwestern College to update and expand the Library and the Learning Resource Center (LRC). The three-level LRC opened in 2002 and incorporates a variety of services, including the Library, Multimedia, Staff Development, the Telemedia Center, the Interdisciplinary Tutoring Center, staff offices, and conference and meeting rooms. It offers students a number of study spaces, including group study rooms and media viewing rooms, wireless internet access, and a growing collection of print and electronic materials. Library services and collections are on the second and third floors of the building. The "Old God" is a universal image in Maya art, and represents wisdom, experience, and respect accorded the elders of all American native people. Among the Maya pantheon, the most important is Itzamnaaj (pronounce "Eat-Sahm-Nah), the patron of learning and writing. He usually wears an obsidian-mirror diadem on his forehead and sometimes appears as his alter-ego, the Celestial Bird Itsam-ye. His image on the LRC elevetor shaft, designed by painting instructor Roberto Salas, is adapted from an illustration in the Dresden Codex, the most beautiful and rare of Maya books (only four Maya manuscripts survive today; all the rest were burned by Spanish friars in 1560), which was a kind of almanac, listing eclipses, phases of Venus, the auspicious days for various tasks, etc. The hieroglyph repeated 14 times across the front of the building is adapted stela D from Quirigua, Guatemala, a beautiful cast of which stands in San Diego's Museum of Man in Balboa Park. It consists of the head of a chop-fallen (nearly toothless) Old God wearing the obsidian-mirror diadem, which identifies him as Itzamnaaj. A Maya convention indicated the god's wisdom by giving them enourmous all-seeing eyes. 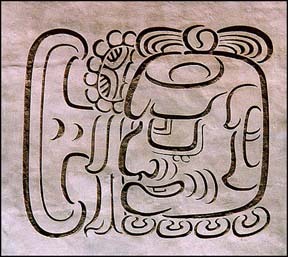 His head is preceded by sideways T-shaped glyph elements that reads Nah, meaning "house" or "temple". Thus the glyph can be interpreted as "House of Itzamnaaj" or "Temple of Learning". It was designed in calligraphic style of ancient Maya books by Mark Van Stone, a professor or art history at Southwestern College. The sundial was incorporated into the design from a historic reference to the Maya culture's use of the sun to measure time while representing the measurement of the students' journey at SWC both daily and seasonally as they complete their education. The glass blocks represent the hours of the day as the point of the shadow cast by the steel blade lands on the blocks. The top arc will tell the time in the winter solstice (December), the middle arc will thell the time for the spring and fall equinox (March and September), and the bottom arc represents the time at the summer solstice (June). When looking at the blade, the first block represents 7 a.m. As the days pass through the seasons, the time shadow will fall somewhere on a vertical arc between the blocks that represent the same hour. The library is a center for research, studying, and collaboration. We ask all of its users to use it with respect and consideration of others. We expect students to comply with the SWC Student Conduct Policy. Filming in the library requires advanced approval. Complete the application (PDF) and submit your request to the main campus reference desk. The library is equipped with computers for students to conduct research. Computer use is on a first-come, first-served basis. Computers in the reference area may be used by community users. All computer uses must comply with District policies. When accessing the research databases and other e-resources from off-campus, you will be prompted to log in. Once you log in with your MySWC account, you will be able to use the databases, e-journals, and e-books just as if you were on-campus. Off-campus access is limited to currently enrolled students, faculty and staff of Southwestern College. Additional help can be found at http://swccd.libguides.com/helpproxyaccess. Having trouble? Fill out an Off-Campus Access Problem Report and you will be contacted to resolve the problem.